Welcome to the official website of the Paranormal Research and Resource Society (PRRS). Use the links on the right to navigate our site, and if you have any questions or comments, please email us at info@prrsociety.org. Join Jenny Stewart and Dave Erickson every Wednesday night at 10PM Eastern/7PM Pacific for a ParaMania Radio show all about the Ghostbox called Distorted Frequency. After the airing of The Haunted episode which featured PRRS we held a review show to talk about the investigation with Vicky, Ashley, Adam. 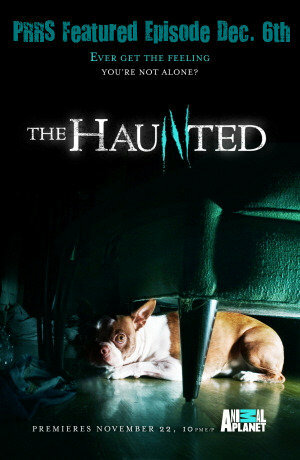 PRRS was featured on Animal Planet's new show The Haunted on December 6th, 2009. The Haunted airs on Animal Planet and Animal Planet HD. The Paranormal Research and Resource Society (PRRS) was founded with hopes of helping those who experience or have experienced paranormal activity. It is the hope of Jenny Stewart, Founder and Director of PRRS that the views of past eras - when even acknowledging a belief in the paranormal would result in ridicule for the believer - have started to fade and the paranormal investigation field will be taken seriously. PRRS is based in Mount Airy, Maryland with members from all across the country, and is willing to provide any assistance to the community by helping to educate, guide or just listen to those in need. If you feel you are experiencing paranormal activity in your home or business and would like information, an investigation, or just someone to talk to that understands what you're going through, please contact us for assistance. If you live outside our region, we can help to locate a reputable team in your area. Any information you provide to us is always kept confidential. If you feel your case is extreme or children are involved, you may contact a PRRS team member directly by going to the "Meet the Team" page and clicking on any member's name to send an email. For all other inquiries, please contact us by filling out the brief form on the "Request an Investigation" page.